Truckstop.com is looking for a talented User Experience Designer to join our Product Development Team. This role will be responsible for developing best-in-class experiences (user interface designs, interaction models, prototypes, etc.) in a fast-paced environment. This person will work closely with product management, engineering and company leaders to successfully go from early stage product concepts to launch. 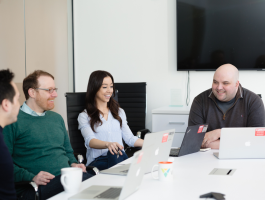 Collaborate with design, engineering, and product management teams to translate user needs into wireframes, prototypes, and other visual designs which effectively communicate high-level design strategies and detailed interaction behaviors. Incorporate feedback from customers, developers and design team members. Gain buy-in from all stakeholders for designs/wireframes/prototypes. Create any necessary digital assets and work closely with lead UX designer to implement the designs. Develop test plans, execute the tests, analyze the results and make recommendations based on test findings. Execute interaction design and visual design as a part of a multi-disciplinary team. Be a self-starter who can quickly jump in without a lot of direction and learn by asking the right questions. Ability to quickly grasp and distill highly complex user design issues into clean, understandable solutions. Must be proficient in Axure RP, Photoshop, and Illustrator. Expertise in user-centered design methods and best practices. Knowledge and experience in both web and mobile UX/UI design. Strong understanding of visual design fundamentals: layout, typography, color, composition, etc. Excellent communication, presentation, interpersonal and analytical skills including the ability to communicate complex, interactive design concepts clearly and persuasively across different audiences and varying levels of the organization. A diverse web-based portfolio that showcases your work. Bachelor's or higher degree in Human-Computer Interaction, Interaction Design, or other design related field. Understanding of common software development methodologies and practices. Experience in the transportation and logistics industry.